Jan 2012 in CCM Digital "Winter Wonder Jam"
Feb 2012 in CCM Digital "Musicians Corner: Story Behind the Song: Crave"
Song: "The Proof of Your Love"
Short Form Music Video: "The Proof of Your Love"
Pop/Contemporary Recorded Song: "The Proof of Your Love"
Rap/Hip Hop Recorded Song: "Caught Dreaming"
Contemporary Christian Performance: "The Proof of Your Love"
Pop/Contemporary Recorded Song: "Fix My Eyes"
Contemporary Christian Performance: "Fix My Eyes"
Pop/Contemporary Album: Run Wild. Live Free. Love Strong. 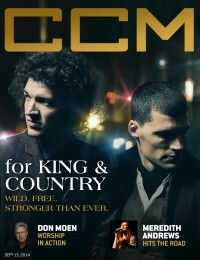 Short Form Music Video: "Shoulders"
Best Contemporary Christian Music Album: Run Wild. Live Free. Love Strong. Best Contemporary Christian Music Performance/Song: "Messengers"